You can adjust the display settings through the options menu. The menus always run at 800x600 but the actual game will run at the selected resolution. Turn on 32-bit color for slightly improved graphics. This changes the sensitivity of controls (mouse and arrow keys). Move the scroll bar to the left for slower speed and more accurate control. Move the scroll bar to the right for high speed but less accurate control. Higher speed is recommended for more advanced players. 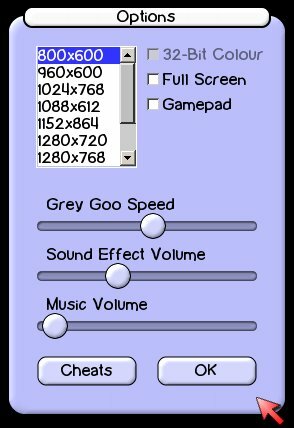 You can change the sound effect and music volume independently using the slider bars. For example, if you want to play your own music in the background, turn the music slider all the way down (to the left). Cheats become available as you accomplish objectives in the game. These objectives are listed on the cheat menu.